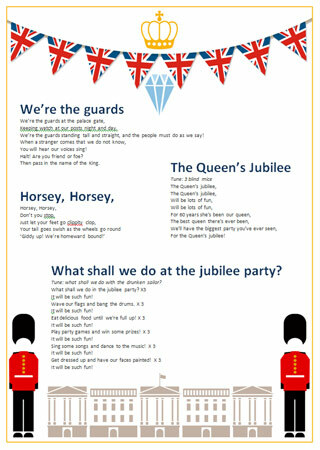 A collection of 4 simple songs to sing in early years settings when celebrating the Queen's Diamond Jubilee. You can listen to two of the songs by clicking on the following links: Song 1: We are the guards . Song 2: Horsey, Horsey . This might be useful as they are not well known tunes. These two songs both feature in our Diamond Jubilee Pageant .